Commenting on night convoy protection during the month, RAF Signals Intelligence noted that such activity had been observed on six nights and that the aircraft involved had been: “3 Do 217 night fighters (2 of NJG 2 and 1 of NJG 3) with … He 111s not bearing the markings of any specific unit”. These last were almost certainly the Heinkels of Kdo. Koch. 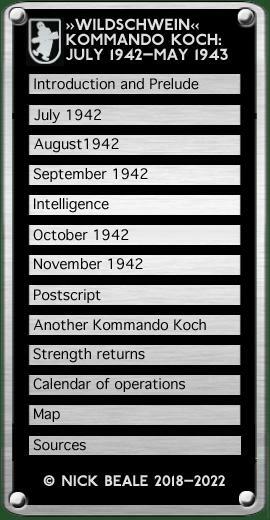 For the Kommando, October began with two jamming sorties, from 1555 to midnight and 1925–0505 on the 1st/2nd. Also in the air was a Do 217 night fighter, R4+DR of 7./NJG 2, which took off at 1947 on a convoy protection sortie of six hours’ duration. Over the convoy from 2100– 0009, the crew saw seven flares dropped and sighted two hostile aircraft which it did not however engage. Early on 2 October, a Wellington Mk. VIII searching the sea 415 km NW of Benghazi picked up signals from what seemed to be a “new ASV jammer situated Cyrene area which was active from 0200 hours to 0430 hours”. Even so, an RAF summary of the period 5 September–5 October noted that “no Wellington VIII strike has failed to find by ASV because of jamming”. NOTE: “Cyrene area” is imprecise enough that it might just refer to WIM 7 at Derna. (Cyrene itself—now Shahat, Libya—is about 70 km from there). The azimuth tube was affected more severely than the elevation tube … The aircraft was fitted with a modified transmitter of changeable frequency, one being better than the other … When the “duff” frequency was in operation the jamming was severe in all positions of the Receiver tune control. When the “good” frequency was in use the jamming was severe when one tuned to maximum signal but when slightly off tune … was almost unnoticeable until the very end of the chase. We had been told to “flash” [switch on the radar] some seven minutes or so before contact was obtained and the interference was in operation within 30 secs. … But I had no trouble on the “good” off-tune point until a range of 5000 feet [1500 m] was reached. Previous jamming experience has produced almost identical results. Originally the Hun seemed to sweep across our frequencies, but for the nine minutes of tonight’s operation he seemed to have a fixed frequency band until the very last moments. The side of the timebase affected most varies with one’s vector and we tried to D.F. on the jamming without achieving any better conclusion than that it comes from somewhere in the North and is not airborne. (above) F/S Doug Oxby's drawing shows how German jamming affected his AI Mk. IV over Malta on the night of 2/3 October 1942. One He 111 Wildschwein up at 1534, jamming from 2045–2130, landed 2252 hours. One flare sighted in 23 East 2415 at 2015 hours. One He 111 Wildschwein up at 1945, jamming from 2120–0030, landed at Tympaki at 0232 hours. Two flares sighted: in 23 East 2433 at 2145 and in 23 East 2439 at 2154 hours. (Flares were at about 2000 m altitude and burned for around five minutes). One Do 217 of the Nachtjagdkommando was up from 1545–1910 hours for protection of the MV Ruhr but broke off owing to bad weather. Eighth Army launches Second Battle of El Alamein.